PRF naturally improves bone healing with dental implant surgery, wisdom teeth removal and bone grafting procedures. 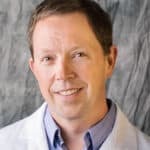 Dr Adams has been using platelet rich fibrin with his natural and holistic surgical treatments in Burtonsville Columbia Maryland near Silver Spring. PRF is made by drawing a small amount of patient blood and spinning it in a centrifuge. There are no blood additives or chemicals. Only extracts from the patients blood drawn just before the procedure. L-PRF is a yellow jello-like mixture of white blood cells, fibrin, platelets, stem cells and bone morphogenic proteins. The platelet treatment is placed during oral surgery procedures into jaw bone holes aka bony defects. The platelet rich treatments do the following things: 1) occupy space in bony holes (tooth extraction sites, implant surgical sites) to prevent gum tissue from growing into bone 2) prevents infection 3) bone growth factors promote rapid growth of high quality new bone tissue. What is PRF Dental Costs? Platelet therapies alone are not too expensive. Usually $300 – $400 which includes drawing blood, processing and placement into the surgical site. Searching for a dentist who does prf? Dr. Gary Adams is a dentist who does prf procedures. “Platelet rich fibrin preparations should be used in most dental surgical procedures…especially wisdom teeth removal…It accelerates and strengthens bone regeneration and lessens the chances of infection, pain and swelling.” Dr. Adams is a big supporter of platelet and fibrin rich procedures for dental implant and oral maxillofacial surgery. Oral surgery procedures come with a great risk of infection due to exposed bone tissue. Especially in cases of tooth removal and implants where penetrations and holes are open deep into bone. Care must be taken during any bone surgery. Wisdom teeth removal procedures come with the highest risk. The areas are very difficult to clean and the jawbone is often already infected at the time an oral surgeon removes them. Platelet-fibrin procedures are invaluable in getting proper healing after removal of wisdom teeth. Platelet Rich Fibrin or PRF is a yellow jello-like mixture of fibrin, platelets, white blood cells, stem cells and bone growth factors. The natural material is fabricated from the patients blood. Prior to a surgical procedure such as wisdom teeth removal, implant surgery or bone grafting, blood is drawn from the patients arm the same as is done for blood testing in a medical doctor’s office. The platelet fibrin material is derived from spinning blood in a centrifuge at 2700 RPM for 13 minutes. The novel natural bone treatment is a great service for any biological dentist doing oral surgeon services with a natural and holistic approach. The holistic platelet treatment is a much better alternative to sending patients home with a naked bony extraction socket or implant site. In many cases, PRF treatment has been proven to be much more effective than gum and bone graft products purchased alone. Pros and Cons of Platelet-Fibrin Dental Treatments? improves success in difficult surgical sites such as root canal removal sites and full mouth dental implants such as all on four implants. How does PRP and PRF Work in Dentistry? Jaw bone is exposed and cleaned during surgery. Bone has very little blood supply compared to other tissues in the body. Tissue where there is less blood, the body has reduced ability to heal properly and less defense against bacterial and fungal infection. We place platelet concentrated treatments into tooth extraction sites and implanted teeth sites. Without prf, extraction sites are commonly left to heal naked and open to the oral cavity. During extraction site healing, saliva, bacteria and other contaminants pour down into vulnerable jaw bone. When platelet and fibrin rich therapies are placed into extraction sockets, the treatment protects the site from infection and enriches the area with proteins and growth factors that promote new bone growth. In sites where implants are placed, PRF occupies the space between the bony socket and the dental implant. Dental implant sites with fibrin-platelet therapy have increased surgical success rates and decreases bacterial infection rates in bone. I-PRF VS L-PRF – What is the difference? I-PRF is termed “injectable prf”. It is processed by spinning the patient blood for a shorter amount of time at a slower speed in the centrifuge. The L-PRF is thicker in consistency like jello. The injectable is more runny like syrup or thick juice. The injectable platelet product, is richer in growth factors and has not yet fully clotted. It can be injected since it is thin in consistency. The most common use for I-PRF in dentistry is mixing it with L-PRF and bone graft products to produce a substance called sticky bone. L-PRF and conventional bone graph products is a loose granular mixture and difficult to work with during surgery. When I-PRF is used to wet the granular mixture, the I-PRF clots after a few minutes and causes the entire mixture to become sticky and clump tightly together. The “clumping” of the bone graft preparation is very helpful clinically when an implant dentist is trying to get a bone graft to stay in a surgical site. What is the difference between PRP and PRF in Dentistry? 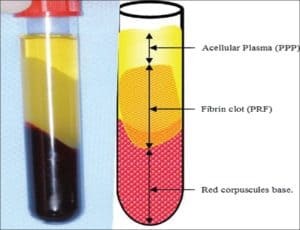 PRP is the red part of the blood spin containing the red blood cells. PRP is not useful in dental bone surgery. 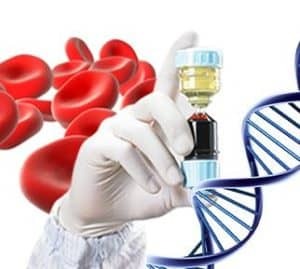 PRP is very useful in injecting into painful joints and other soft tissue areas but not in dentistry. Tooth Extraction Sockets – platelet rich fibrin when placed into a tooth extraction site will reduce the risk of dry socket and infection after tooth removal. Most importantly, PRF dental treatment places the much needed immunological protection (white blood cells) and regenerative growth factors to promote proper healing in jaw bone. A ubiquitous problem in dentistry, is jaw bone infections that persist for day, months and sometimes years after oral surgery procedures. Dental Implants – PRF dental treatment when placed around implants during surgery accelerates implant healing and improves the quality of bone growth around implants. Platelet treatments appear to be help in titanium and zirconia dental implant surgery. Bone Graft Surgery – L-PRF can be processed and mixed with conventional bone graft products along with I-PRF to product a mixture called sticky bone. Sticky bone is an invaluable bone regeneration tool for any implant dentist or periodontist. Sticky bone can be especially helpful in getting severely infected root canal removal sites to heal properly. Sticky bone is also very helpful in building bone volume as in doing block bone grafts. PRF Membranes – when bone grafts products are placed into bony defects, the bone products can fall back out of the bony hole. Additionally gum tissue can grow into the area where the bone graft resides and prevent bone regeneration in the site. In these cases PRF membranes can be placed to prevent fall out of the graft and undesirable soft tissue growth.